You are eligible to participate in the contest if you are a resident of Uganda and have a Facebook, Twitter or Instagram account. The three lessons can be as diverse as possible: from recipes passed on from your mother to the kind of people you are allowed to date to every day tips like how to remove an ink stain from cotton. It could be advice that her mother passed on to her. Let’s read those words of wisdom. · The general Facebook, Twitter and Instagram pages of Sooo Many Stories, Kampala Serena Hotel and Aristoc Booklex Uganda have been liked/followed. · Entries are submitted by a public Facebook, Twitter and Instagram page account. · Entries are submitted by an individual entrant. · Facebook: The note should appear just below the comments section on the current running #MamasBookOfTricks post of Sooo Many Stories Facebook. 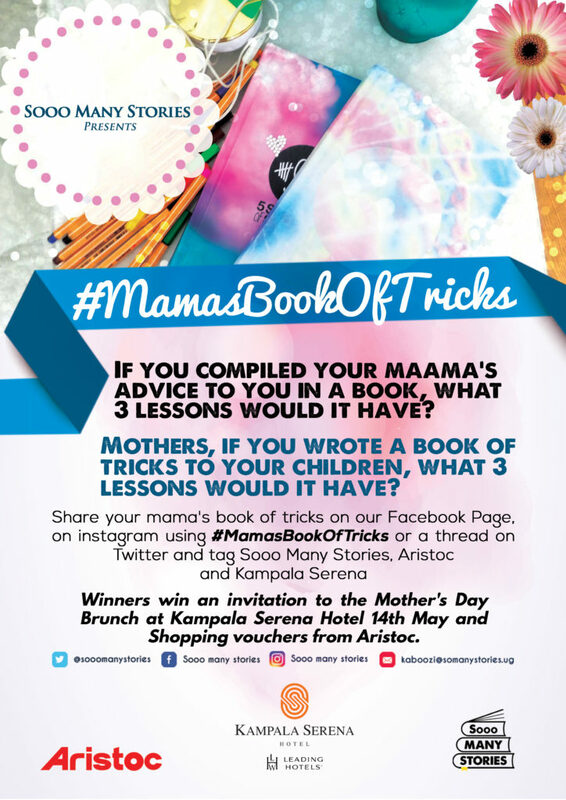 The Mother’s Day #MamasBookOfTricks contest will run from 9th May to 12th May 2017. We shall award four winners. An invitation to two mothers and their children to the Mother’s Day Brunch at Kampala Serena Hotel on Sunday 14th May and two shopping vouchers from Aristoc Booklex worth Shs50,000 each. We shall bond over books at the Mother’s Day Brunch with our fireplaces among other things. Let’s record and pass on some wisdom! Happy Mother’s Day!